Recently launched autism centric online business expands its versatile product lineup to create awareness among people of all parts of the world. California, United States - February 8, 2018 /MarketersMedia/ — Designs By Siri, an Autism inspired online business is excited to announce the addition of new and exclusive products for jewelry enthusiasts. 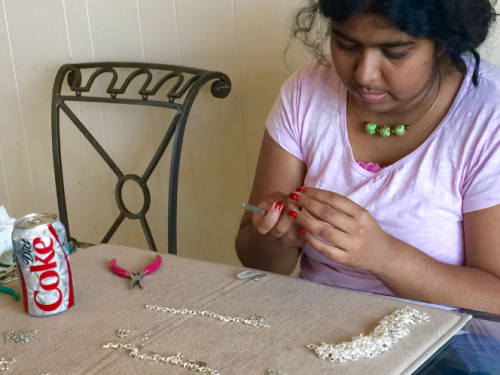 The entire assortment of necklaces, bracelets, and other items, were handmade by individuals with autism. As Swathi Chettipally, the mother of Siri and founder of Designs By Siri recalls, she wanted individuals with autism to collaborate and express their creativity through arts and craft. The products are a way of expression for people with autism, a common mental disorder, whose talent is often not uncovered or ignored by the society. Through a unified platform, the company’s products are not only becoming popular among consumers over the internet, but are also creating awareness about autism disorder. Thanks to an overwhelmingly encouraging response from customers, Deigns By Siri is widely appreciated for its original pieces. The jewelry items reportedly have a distinctive appeal, as they are especially designed and created by Siri and her friends. Siri is a very talented young lady among thousands of children and adults with this condition. Designs By Siri is a U.S. based online jewelry and assortment business. The company’s entire range of bracelets, necklaces, ear rings, wine glass rings and Autism Awareness products are made by individuals with Autism; a mental disability that affects 1 in 45 children. The proceeds of this business goes to individuals with autism to provide an opportunity to express their creative energy, bring them out of their shell, boost their confidence and help them become productive members of the community.